Coachella’s just a month away! And with the lineup for 2019 including Childish Gambino, Ariana Grande, and Tame Impala, festival season is going to be lit this year! That’s why it’s more important than ever that you look your best at Coachella. But you can’t just rock any hairstyle for a music festival. 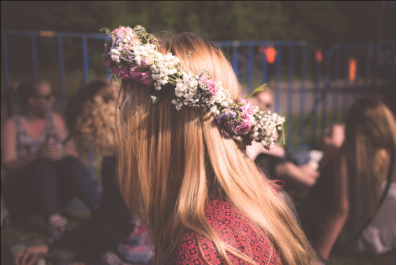 Your Coachella hairstyle needs to follow the three Fs: fashionable, functional, and freeing. Add a flower crown for the optional fourth F and you’re festival ready! Whether it’s the sultry music of Lana Del Rey or the high falsettos of a Florence and the Machine song, you can just envision yourself in a flowy white dress, swaying in slow motion to the music. And with retro glam being the aesthetic of most music today, why not go all in with the classic Double Bun look that was popularized by both Baby Spice and Princess Leia. The best part is that the style is very versatile. You can tie all your hair up to replicate the look as is or add in a few braids or other patterns to play with it. Music festivals allow you to experiment with hairstyles that are a bit too out-there for everyday life. Last year at Coachella, a ton of attendees were seen wearing multiple kinds of braids at the same time. Get a friend or your hair stylist to give you an eclectic mix of Dutch braids, fishtail braids, three-strand braids, etc. Experiment with a bunch of styles before you’re happy with the aesthetic. If you’re worried that it’ll look too messy, don’t! ‘Natural’ and ‘messy’ hair fit in perfectly with the festival vibe. Braids are also great for Coachella because you’ll be there for three days, making their low-maintenance nature a godsend. While some people think that the flower crown trend is done and dusted, don’t let that dissuade you from living your Janis Joplin, Frida Kahlo fantasy. Accessories is the name of the game: keep your hair the way it already is, but adorn it with flower and tree motif hair charms, a flower crown, and maybe a headscarf with floral motifs. A headscarf will also make your festival look low-maintenance, allowing you to let go and enjoy Coachella to its fullest. If your roots are growing in and you don’t want them to show, you can use glitter to not only hide them, but also to give yourself a truly unique aesthetic. Firstly, use braids or a hairstyle that has a parting to accentuate them. Then, mix a hair gel with whatever combination of glitter you want, and apply it to your roots. Just be wary of the glitter… getting everywhere. Washing up afterward will be a chore. Hair Extensions of Houston is one of the leading luxury hair salons in Houston, TX. If you’re looking for natural hair extensions or services, our team of stylists can cater to your every need. Contact us at 832-717-3626 and book an appointment today!